My experience with Craftsy has been great. I am enrolled in four different classes in a variety of subjects- sewing, knitting, crocheting, and bread making. So far I've had great luck with all the classes I've tried. The instructors have been great at explaining things. They don't overwhelm you, or tell you that you need to buy a bunch of supplies to get started. I work the afternoon shift and live in a small community, so my options for taking a class around here are pretty limited. 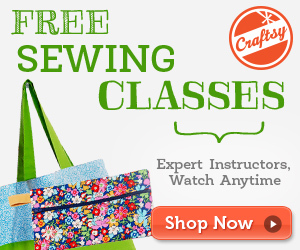 Plus, I do better in small groups or one on one, and Craftsy feels very one on one. I love the online platform because I can go at my pace and pause the videos as I go. The lessons are streamed right from the website. There's no timeline for how often you have to sign on and no limit for how many of times you can watch a video. You can type notes to each lesson as you go that are saved to the video. You can post pictures of your finished projects. If you're interested in learning a new skill, I highly recommend Craftsy. It's pretty awesome. And if you're not sure about dropping the moolah on class, try one of the free ones so you can get your feet wet and try out the platform. See how you like it. Check out free classes by clicking on ad above.